These points will cause your insurance premiums to rise significantly, and you may be subject to other penalties, such as the Driver Responsibility Assessment. In addition, if you are convicted of 3 speeding violations within 18 months, your license may be revoked for at least 6 months. New York speeding ticket lawyers can work to save you from these consequences and make sure you do not suffer hardships due to the stiff financial penalties of New York City speeding tickets. Attorney Michael Block has more than 25 years experience fighting traffic tickets and achieving positive outcomes for his clients. 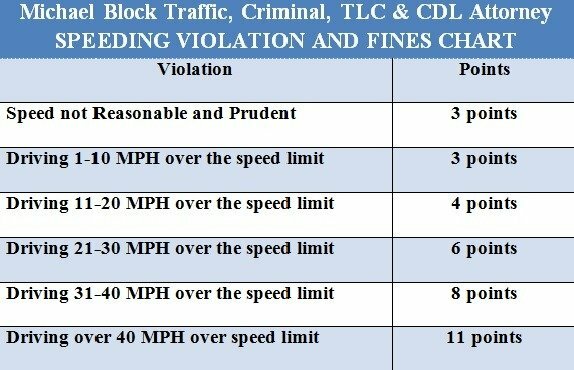 When you receive a New York speeding ticket and would like to keep your insurance premiums as low as possible, as well as maintain your driving privileges, please contact Michael Block, Speeding Ticket Lawyer at 212-227-9008 for a free consultation.